Photos Won’t Delete from iPhone iOS 12/11? Easy to Handle! Have you been trying to delete a photo album from your iPhone X or 8, but every time you try, the trash can icon is grayed out? iMyFone Umate Pro or iMyFone Umate Pro for Mac is the world’s most affordable iPhone cleaner of all times for freeing up iPhone, iPad or iPod space. Umate Pro was smartly built with 25+ analytical technology which makes it capable of compressing, exporting and erasing all kinds of iPhone photos in one click. This software is very useful in cleaning junk and temporary files, manage large files and apps in bulk, permanently erase ios data and is fully compatible with all versions of iOS. Umate is the perfect solution to “why can't I delete photos from my iPhone on my computer”. Hence, if you want to erase an undeletable iPhone photo, here is how to accomplish. Step 1: Download and install Umate software on your PC, run the program and connect your iDevice. Step 2: Click on the photo tab, and choose “Export & Delete” and the program will begin to scan your iPhone. Step 3: After the scan finished, you can preview all the photos, then select the photos to delete. Step 4: Click on “Backup & Delete” to complete the process. 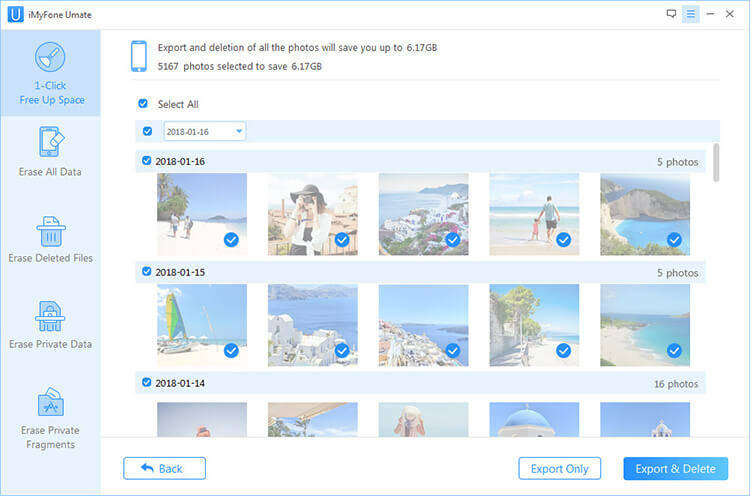 Bulk Delete Photos, Even the Photos Cannot Delete by iPhone: including current photos, previously deleted photos and the photos that “won’t delete from iPhone”. 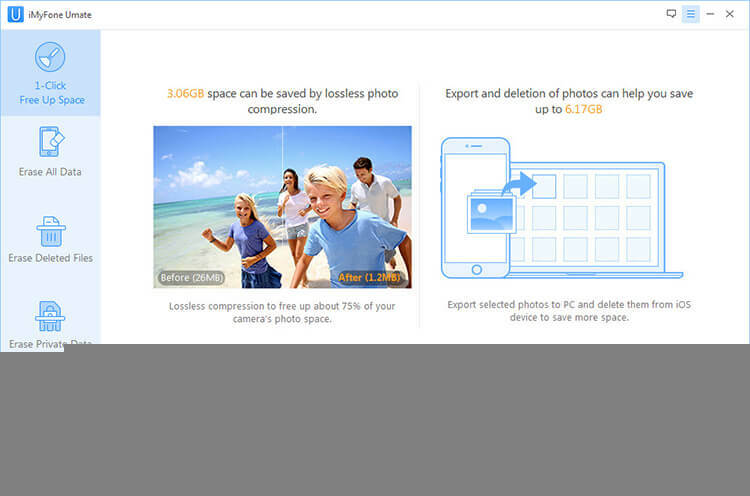 Compress Photos: it can compresses photos losslessly to release 75% of iOS photo space. Export Photos to PC or Mac: It exports original photos to PC or Mac as a backup for future use. You can preview your iOS 12/11 Photos on Umate interface before choosing choose to delete some or all of it. 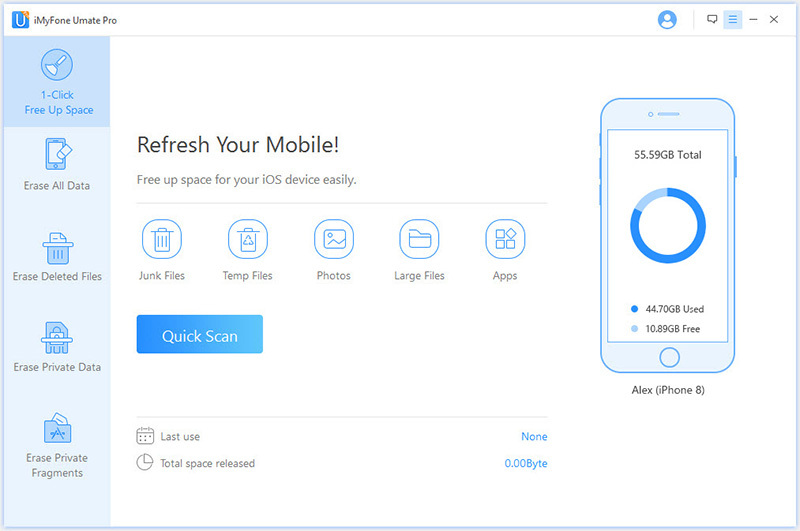 Clear Up iOS Photo Caches: iMyFone Umate Pro also ensures to erase all iOS photo caches that occupy your iOS memory space and slow down your iPhone. I have seen a couple of occasions where iPhone won’t let me delete photos, and I got to ask why iPhone won’t delete photos. I took my grievance to Apple forum, but I saw that other users are having the same experience. Then I got to research on the type of photo files you can and cannot delete the Photo app. I got to find out that photos or albums that were copied to my iPhone by syncing with my computer cannot be deleted from photo app, but by deselecting such photos or albums from iTunes while carrying out another sync. 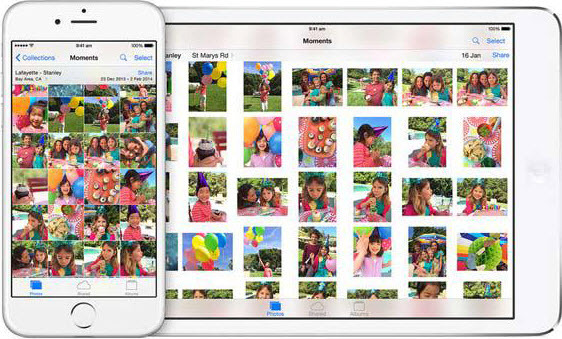 Can iCloud Photos be deleted? Yes, iCloud photos can be deleted when you turn on your iCloud Photo Library while deleting photos from your iPhone. The truth is that such photos will also be deleted from all your iOS 12/11 and macOS devices that were connected to that iCloud account. Many people get to ask “How can you erase a photo off your iPhone without erasing off your iCloud Photo Library and other iOS 12/11 or macOS devices?” The simple answer is “turn off your iCloud Photo Library” before erasing any iOS photo. If you have any contribution, questions or inquiries concerning your iOS 12/11 photos not deleting, just drop a comment below. We’re always looking for inquiries to answer, and problems to solve.